- Publisher The discovery of the Dead Sea Scrolls, the Nag Hammadi texts, and new Targums has left biblical scholars increasingly interested in the relationship between the New Testament and first-century Judaism. This critically acclaimed study by Richard Longenecker sheds fresh light on this relationship by exploring the methods the earliest Christians used to interpret the Old Testament. By comparing the first Christian writings with Jewish documents from the same period, Longenecker helps to discern some of the key differences between Christianity and Judaism. This second edition of Biblical Exegesis in the Apostolic Period brings Longenecker's valued work up to date with current research in this important field of study. - Publisher Extensive revision! Solid, evenhanded treatment of how the Scriptures were understood in the early Christian era---from the literal, midrashic, pesher, and allegorical approaches in Judaism to the early church's use of Old Testament quotations. Refers to testimonials, sermons, and catechisms. About "Biblical Exegesis in the Apostolic Period (2nd Edition)"
The discovery of the Dead Sea Scrolls, the Nag Hammadi texts, and new Targums has left biblical scholars increasingly interested in the relationship between the New Testament and first-century Judaism. This critically acclaimed study by Richard Longenecker sheds fresh light on this relationship by exploring the methods the earliest Christians used to interpret the Old Testament. By comparing the first Christian writings with Jewish documents from the same period, Longenecker helps to discern some of the key differences between Christianity and Judaism. 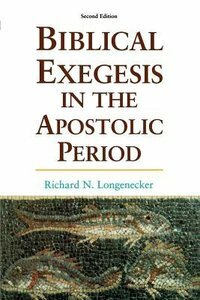 This second edition of Biblical Exegesis in the Apostolic Period brings Longenecker's valued work up to date with current research in this important field of study. Extensive revision! Solid, evenhanded treatment of how the Scriptures were understood in the early Christian era---from the literal, midrashic, pesher, and allegorical approaches in Judaism to the early church's use of Old Testament quotations. Refers to testimonials, sermons, and catechisms. Richard N. Longenecker (Ph.D., University of Edinburgh) is distinguished professor of New Testament at McMaster Divinity College, McMaster University, Hamilton, Ontario, and professor emeritus of New Testament at Wycliffe College, Toronto. He is the author of numerous scholarly works including Biblical Exegesis in the Apostolic Period; Galatians (Word Biblical Commentary series) and Romans (New International Commentary of theGreek New Testament)- most recently he has produced Introducing Romans: Critical Concerns in Pauls Most Famous Letter (Eerdmans, 2011).